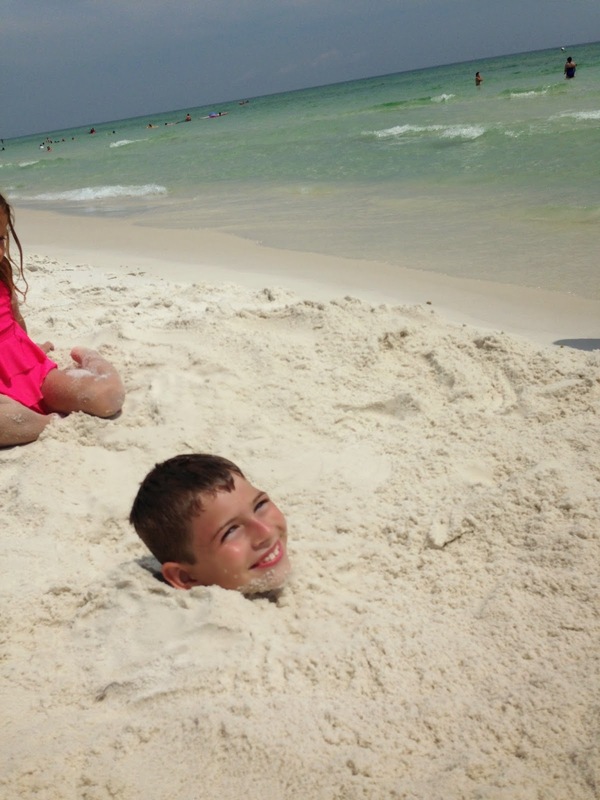 When I was a kid, one of my best friends used to go to Destin every summer. I would listen with envy when she talked about the clear water, the white sand, and finding sand dollars in the ocean. My dad was a fisherman, so our frequent beach visits were always to places like Port Aransas, Texas, that could double as a fishing trip. There is much to love about the Texas coast (minus this summer's horrible seaweed invasion) but you definitely can't see your feet in the water. I confess it makes my inner third grader unbelievably happy to visit a white sandy beach with clear water. Two weeks ago when our truck began the journey down 30-A in Florida, Jackson saw a giant sand dune and said, "Mommy, is that sand or snow?" Exactly! 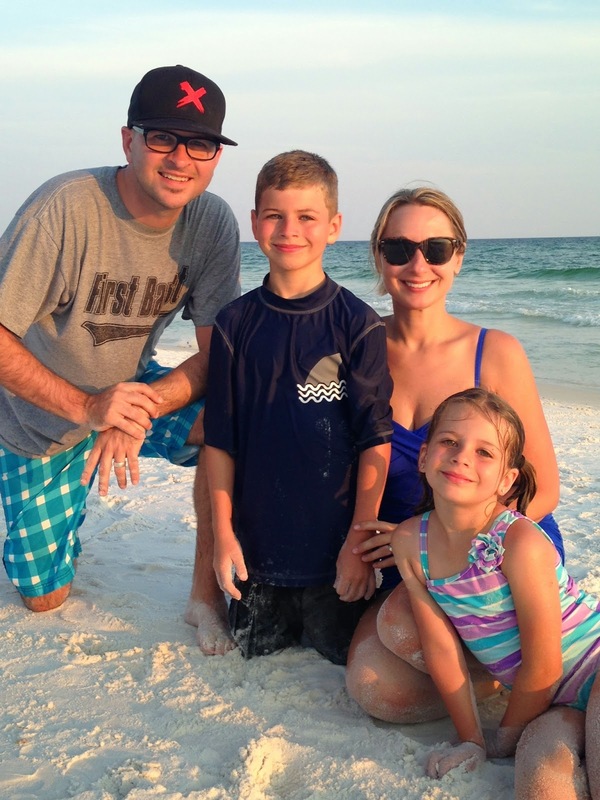 It was a dream to get to visit Santa Rosa Beach with some of our closest friends. 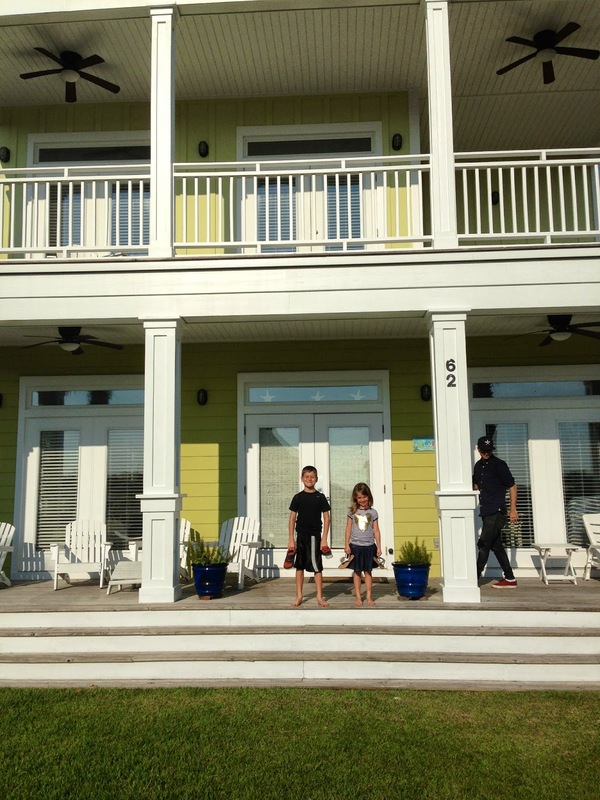 We rented a darling beach house that was big enough for 4 adults and 7 kids. Holding to tradition, Curtis made awesome sand castles, Jackson got buried in the sand, and I was inseparable from the boogie board. We learned how to find sand dollars with our feet, which was so fun. I'm highly skilled at finding hermit crabs in Galveston (it usually starts with "Ouch!") but this was more challenging. Annabeth really took to the water and spent most of the time riding the waves with her little board. She was very fun to watch, even if she did make me a little nervous. Crista and I discipled the girls in the (very complex and gourmet) art of making pigs in a blanket. Every day we walked across the street to a place called Pop Stop that had "artisan popsicles." Oh my word, they were so good! My favorites were the banana pudding pop and the cookies and cream pop. I have been longing for this place since we got back home. Here is a picture of Jackson encrusted in sand and with a cookies and cream goatee. When he saw himself in the mirror he said, "Whoa." Hahaha! I think he was embarrassed that he had been seen in public like that. Here are our beach adventurers. This was taken after we ate a sunset picnic dinner of meatball subs wrapped in foil. It is already one of the neatest memories of our family's life. Right after we took this I said, "This is probably the last picture of us as a family of four." 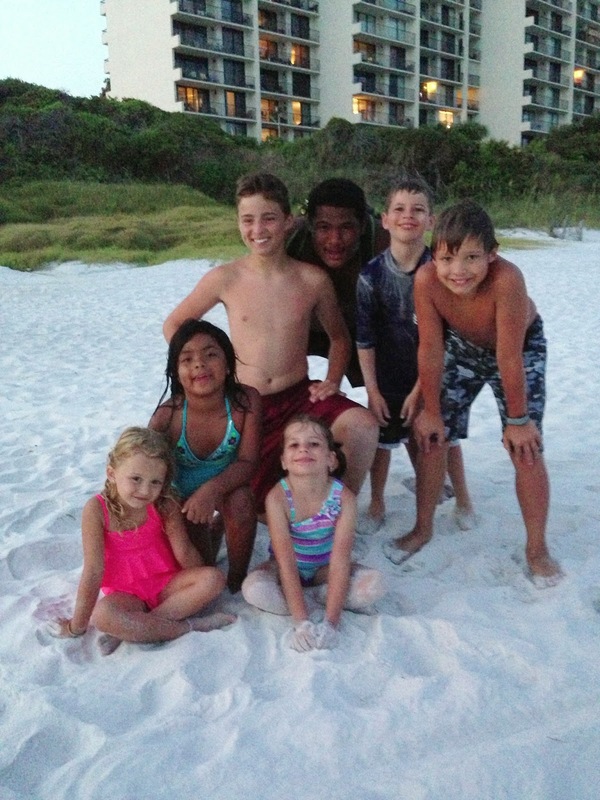 On our third night at the beach, I got a phone call from our adoption agency. I couldn't believe my ears when they said a baby had been born who needed a family. No one else was available to receive the baby at this time. Were we open to him? Curtis and I were in shock. We had told the agency we were only open until the end of summer and after that we would be moving on. We really didn't think anything would work out at this point. We left the kids with our friends and went on a walk. We found our faith and let our hearts warm up to this possibility. We decided that we would say yes, give it another day to let everything solidify, and then drive home to receive our new family member. We didn't tell the kids what was happening or let them know that we were actually leaving the beach three days early, but I couldn't wait for the moment when they would be surprised with the news. I was told to make a newborn appointment with our pediatrician for right after placement. We had neither named nor seen a picture of the baby yet. The doctor's office asked me the race and I didn't even know how to answer that question. The receptionist had to know a name, and I knew what name Curtis wanted, so I literally named the baby right there on the phone. It was very surreal. By the time we got on the road on Wednesday morning, the papers had already been signed. It was looking like all the chaos and emotional pain of the last year was about to make sense. The thing I was most excited about was the potential healing of my spiritual wounds. I had lost almost all confidence in hearing the Spirit's voice. I had stopped looking for the God-connections in everything, which comes as naturally to me as breathing. 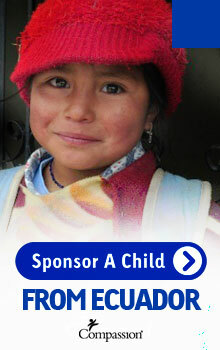 Some of the dearest parts of me had suffered near-fatal blows on this adoption journey. If this worked out, I would know I hadn't misinterpreted what I sensed to be God's direction after all. It would change everything. The drive home was going to be 10.5 hours. We left at 6:30 AM so that I would have a little bit of time to shop for an infant carrier before all the stores closed. The placement ceremony would be the following morning. When we had been on the road about four hours, we got word that things were not as stable as we thought. And then when we were too far to turn back around, we got word that it was all over. A slap in the face. A punch in the gut. Those things don't sound severe enough to describe how this felt. It was like the enemy custom-designed a plan to see how miserable he could make us before the adoption timer ran out. This felt so very personal. I had finally accepted the outcome that we would never adopt and had adjusted my expectations to it when this was dangled in front of my face. And when we let our hearts warm back up, left a dream vacation half-way through, and were too far to turn around, it exploded and left us bloody. I felt like a young woman whose ex-boyfriend talked her into getting back together, proposed, and then left her at the altar. I felt stupid, naive, and very angry. When I think with the mind of Christ, I know that we did not lose. We believed God again. We didn't let our comfort or fun sway our decision. We did not operate in fear or self-protection. I know that even if this never, ever, ever makes sense until we meet Jesus, we won the spiritual battle. There will be reward in heaven that the enemy cannot steal, kill or destroy. It's been a little over a week since it happened and I'm still sad. I've been surrounding myself with friends as much as possible, but when it's quiet at home my heart is heavy. This journey is over - for real this time. It is very hard for my soul to accept. My subconscious keeps bubbling up hopeful thoughts that the agency may call us again. But we have told them not to. This is the fourth baby we have opened our hearts to. My stubborn self would never give up if my husband weren't saying, "Enough!" I will be glad when acceptance has made it all the way through my being. When you have fought so hard for something it takes a while for your soul to settle down and be still. I am thankful that even though it seems like the enemy was allowed to sift us in this process, God restrained him. We were protected from having a child cross the threshold of our door who wasn't meant to be ours forever. I know many people have experienced that nightmare. I myself experienced it during my adolescent years as a brother came in and then went out after 7 years. I had so desired to see the redemption of that difficult experience. You know what I learned? I don't get to tell God how to redeem something. He does redeem, but it's on His own terms. Somewhere along the way I made the mistake of thinking it was up to me.